We try to make travelling with kids as easy as possible, and fun too. The services we provide for infants and children are based on aircraft types. To find out the aircraft type for your journey use our flight schedules. An infant under the age of 2 years can travel on domestic flights within New Zealand for free or on international flights at 10% of the adult fare. In both cases, the infant is not allocated a seat and must be held by an accompanying adult, who is 15 years or older. Only one infant per adult is allowed to be held. On Air New Zealand operated flights a second infant can travel in a seat on a child fare, if you provide an approved car seat or CARES child restraint system. If you have made a reservation to travel with your infant on a domestic flight within New Zealand, your infant will not be issued a ticket or receipt as they do not pay a fare and will not occupy a seat. Child fares are for people aged 2 to 11 years inclusive. There are no child fares on NZ domestic or Tasman and Pacific flights. On our long haul flights, except for Business class, child fares are available at 75% of the adult fare. Children may be booked to travel alone or otherwise must be travelling with an adult who is 15 years or older. For children travelling by themselves refer to our children travelling alone page. If you’re booking online, just select a seat with a bassinet icon from the bassinet row. Not all seats in this row have bassinets, so please select carefully. You’ll be asked to confirm the infant will meet the age and weight limits when they fly. If it turns out they don’t, you may be asked to move and will not receive a refund on any seat select fee. If you are travelling with an infant aged between 8 and 15 months who does not weigh more than 11.8kg (26lb), we may be able to allocate you a bassinet seat when you check in. It should also display one of these manufacturing standards marks. Car seats can’t be used in Business Premier™ lie-flat seats on all 777 aircraft. This is because the Business Premier lie-flat seats are sideways facing therefore the seatbelt has an airbag in it. For safety reasons, child booster seats and/or booster cushions are not permitted as they are designed to be used with a diagonal seat belt rather than a lap belt. The CARES child restraint system. CARES has been approved for use on Air New Zealand flights by the New Zealand CAA (Civil Aviation Authority). The MERU TravelChair. The TravelChair is a postural support chair that has an adjustable headrest, footrest and body harness for children with disabilities who may not be able to use a standard car seat or airline seat without additional support. It is suitable for children from 3-11 years (depending on their size and weight), please note that there are some restrictions on how and where the MERU TravelChair can be used onboard, so please ensure you contact us prior to travel at specialhandling@airnz.co.nz or +64 9 255 7757 (please note call charges apply). Please note: the Business Premier lie-flat seats are sideways facing therefore the seatbelt has an airbag in it. This means infant car seats and the CARES restraint system and MERU TravelChair are not able to be used in the Business Premier lie-flat seats on all B777 and 787 aircraft as it would impede the deployment of the airbag in the event of an emergency. On board use of non-aviation certified products is prohibited on any Air New Zealand aircraft. This is due to safety concerns and potential reliability issues regarding our Air New Zealand products or furnishings. Included are the Fly-Tot, JETKIDS Bedbox and LegsUp leg hammock. Infants and children can take a stroller and/or car seat for no extra charge in addition to any other allowances, even if their fare does not include checked baggage. Single strollers like this with a completely collapsible frame and seat will normally fit in the overhead locker on our 777-300, 777-200, 787-9 and A320 Domestic aircraft only. On our other aircraft they must be checked in because there is limited locker space. If the flight you are travelling on is full, airport staff may request that your stroller is checked in. Prams, three-wheeled jogger-style buggies and larger strollers do not fit in the overhead locker and must be checked-in on all aircraft. 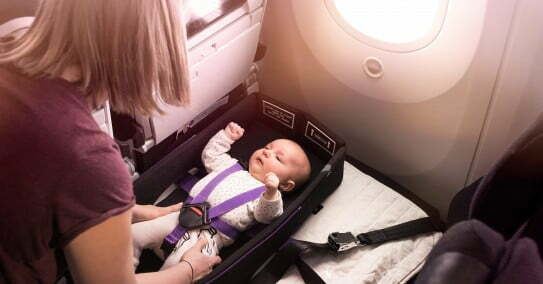 The Skycouch Infant Harness, Belt and Pod will be available on all Air New Zealand Boeing 777 and 787-9 operated long-haul services from later in 2018 and will be provided to all Economy Skycouch customers travelling with infants by cabin crew. The Skycouch Infant Belt loops through the infant harness and is secured by a clip in the window seat of the Skycouch. The belt can be tightened for a snug fit which will secure the infant in the event of turbulence. When seated in an upright position, the adult's seat belt can be fed through the back of the harness to secure the infant on the adult's lap. To book a children's meal for your child, select the children's meal option when you book your flights, or request it through the contact centre or your travel centre after you've booked. Please do this at least 24 hours before your departure. If your child has special dietary needs, pre-order special meals are available on our long haul international services. Please contact the contact centre for assistance at least 24 hours before your departure. More information about self-catering and food allergies. Where possible, the cabin crew serve children's meals before serving adults, so you can feed your child before relaxing and enjoying your own meal. When you book an international flight and order a children's meal we include a fun kid's pack. Children have their very own section with movies, TV programmes, games and audio books that are all suitable for little ones. Find out more. To ensure the safety and wellbeing of children travelling together, we strongly recommend you travel with one adult for every five children. Any passenger under 18 years old, that resides in a French Territory (excluding Noumea), must obtain authorisation to leave the country (known as an AST) for any journey outside a French Territory (excluding Noumea) without a parent or legal guardian. For flights with other airlines, including our codeshare and partner flights, please contact the operating airline.